You can still read the original teabag post here, but I thought it was about time to write an update. 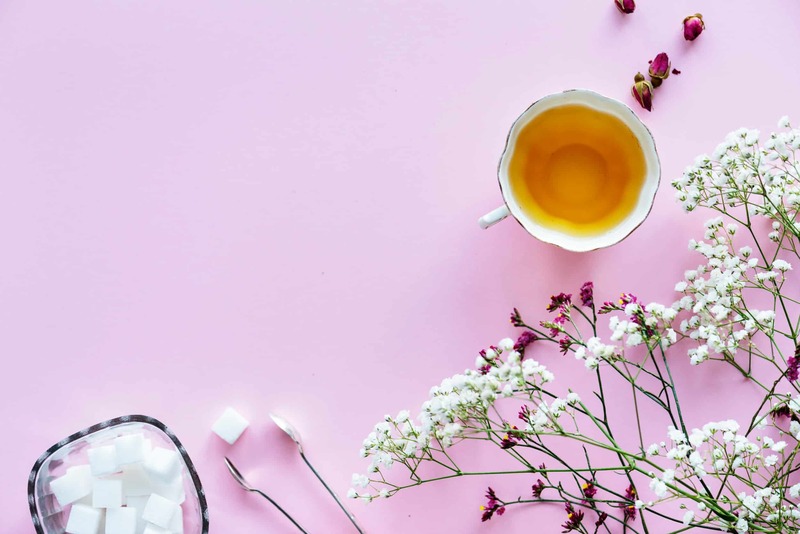 After all, there’s still a lot of misinformation and confusion around which teabags contain plastic, and what the plastic-free options are. Can it be that every time we made a brew, we are stewing plastic in our cup alongside our tea leaves? I do so hate to be the bearer of bad news, but yes. If you’re a teabag-using tea drinker, it is more than likely that there’s plastic in your teabags. Wait! I hear you say. Not all teabags are equal! True. 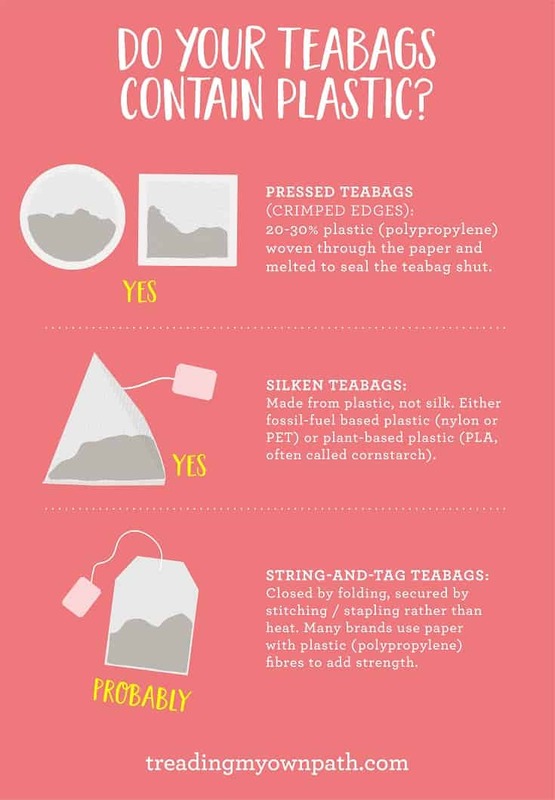 When it comes to teabags, there are different types. Those different types use different types of plastic, and use it in different ways, but the majority still contain plastic. There’s the regular pressed paper teabags (the ones with the crimped edges) and yes, these contain plastic. The main reason is that these crimped teabags are pressed shut using heat, and the plastic melts to seal them together. Typically the paper in these teabags contain 20 – 30% plastic. Then there’s the premium ‘silken’ type, which are always made from plastic (not silk, like the name suggests). The only teabag type that might be plastic-free is the string-and-tag variety: these can be folded shut and secured with a knot or a staple. But many suppliers of these teabags still choose to use paper with plastic fibres for added strength. You’d be forgiven for thinking that organic teabags would be plastic-free, but in fact, the majority of those contain plastic too. These are the standard square, rectangular or occasionally round teabags that have crimped/pressed edges on all sides, and they always contain plastic. The two separate layers of paper need to stick together to keep the lea leaves in, and paper does not stick to paper by itself. Glue would dissolve in your tea – yuck! Plastic (usually polypropylene, or less commonly a mix of polyethylene and a polyethylene co-polymer) is woven in between the paper fibres, and melts upon heating to seal the teabag shut. Typically these teabags contain 20-30% polypropylene. In addition, some companies choose to treat their paper teabags with a chemical called epichlorohydrin to help prevent tears. This chemical is deemed a probable human carcinogen. It is also known to react in water to form another chemical, 3-MCPD, another possible human carcinogen. Despite the name, silken teabags are made from plastic, not silk. Usually found in a pyramid shape, the fibres of silken teabags are woven to make them look like fabric. These teabags are either made from fossil-fuel based plastic (usually nylon or PET – the same plastic that drinks bottles are made from: plastic #1), or plant-based plastic (PLA or poly-lactic acid, usually derived from corn or other plant starch: plastic #7). When a company says their tea bags are made with cornstarch, they mean plant-based plastic. Silken teabags are often spruiked as an eco-friendly choice, but teabags made from fossil-fuel based nylon or PET will last forever – clearly not eco-friendly at all. Plant-based plastic teabags are labelled “eco-friendly” as plants are a renewable resource. Plant-based plastic is sometimes labelled biodegradable, or compostable. However, just because a silken teabag is made of plant-based plastic, that does not automatically mean it is biodegradable. It is more complicated than that. Biodegradable means broken down by microorganisms over time. There is no stipulation for avoiding toxic residue, nor a requirement that the plastic breaks down into constituent parts, just that it is no longer visible. 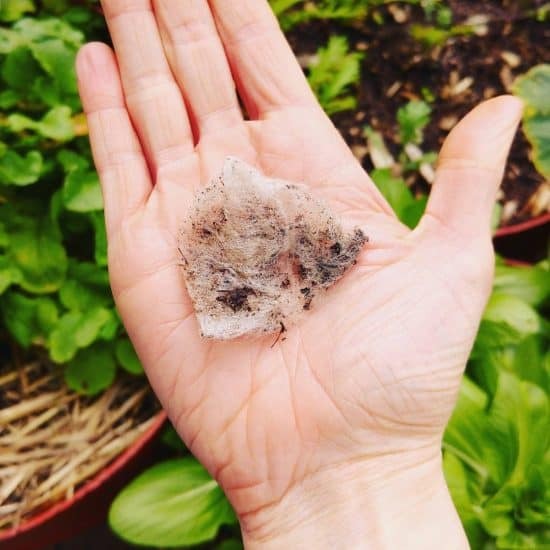 Compostable means something different: that the product undergoes biological decomposition at a compost site, and breaks down into carbon dioxide, water, inorganic compounds, and biomass, leaving no toxic residue. The filter paper used to produce teabags with a string and tag attached does not need to contain plastic polymer fibres: these teabags close by folding, and are secured by stitching or stapling, rather than by heat sealing. However, many teabag producers (including organic brands) still choose to use paper with plastic (polypropylene) fibres to add strength to their teabags. The string is usually made from cotton. If you find a plastic-free variety, these teabags are completely compostable. Teabags made entirely of paper will rip more easily, and will disintegrate if left to stew in a cuppa. If your teabag seems remarkably resilient, the likelihood is that it contains some plastic fibres. 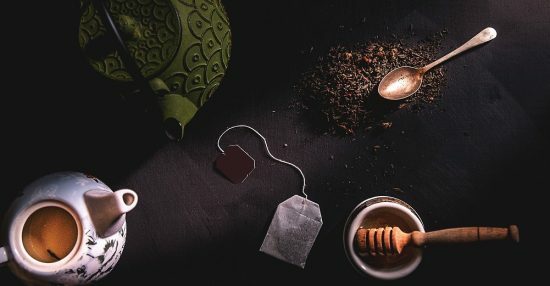 Plastic-Free Tea: What Are the Solutions? 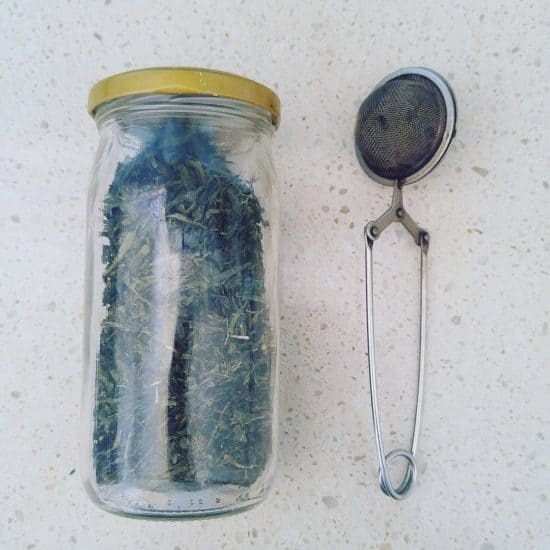 There are two solutions for truly plastic-free tea. Option One: Look For Paper Teabags That Do Not Use Plastic As Reinforcement. These will be the string-and-tag teabags, but check with the manufacturer as many brands still contain plastic. Brands that have confirmed that they do not use plastic in their string-and-tag teabags include Tea Tonic, Pukka teas (although their envelopes are plastic) and Clipper (string-and-tag only: their pressed teabags contain plastic). 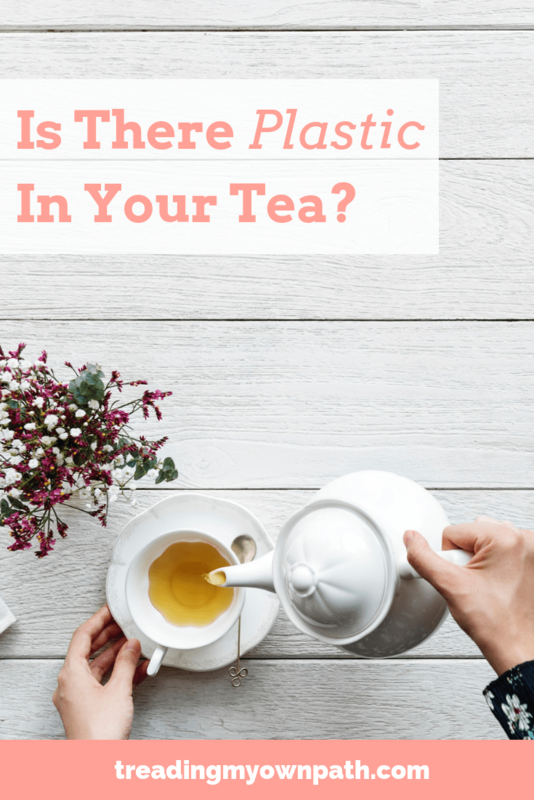 Bioplastic is still plastic (even if it’s labelled as biodegradable or compostable) so if you really want to choose a plastic-free teabag, steer clear of anything labelled bioplastic, plant-based plastic, or cornstarch. 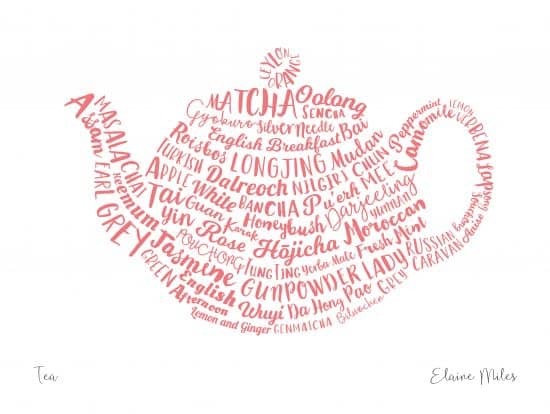 My absolute favourite option is to choose loose leaf tea. The lowest waste option is to buy from the bulk store. If that’s not practical, loose leaf tea can be purchased in tins and cardboard boxes that are fully recyclable. Loose leaf tea is not as expensive as it appears. Loose leaf tea is often priced per kilo, whereas teabags are priced per bag, which makes it hard to compare. Actually, it only takes a couple of grams of loose leaf tea to make a cuppa. The other great thing for cheapskates like me (or rather, people who prefer weak tea) is that it’s much easier to brew a second cup reusing loose leaves than it is with a teabag. If teapot-washing isn’t your thing, tea steepers are a great way to make a single cup without the hassle of extra washing up. If you aren’t ready to give up the teabags, there are refillable cotton bags out there, too. Finally, if you’re a herbal tea drinker, ditch the dried stuff altogether and use fresh leaves. 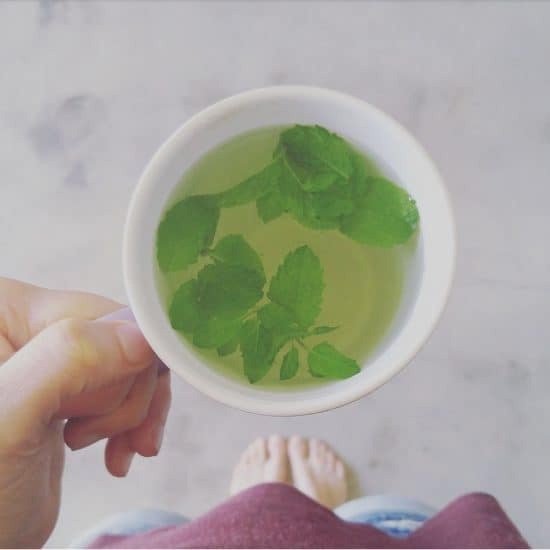 Mint is one of the easiest herbs to grow and there’s nothing like a cup of fresh mint tea. Now I’d love to hear from you! Did you know that most teabags contain plastic? If you did know, have you made the switch? 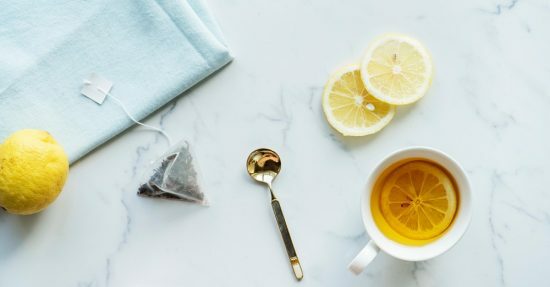 Have you found a brand of plastic-free tea? Have you given up the teabags and embraced the loose leaf? Have you found a different solution? Please share in the comments below! 39 Comments • Leave a comment! ← Is There a “Best” Kind of Reusable Bag? 39 Responses to Is There Plastic in Your Teabag? I’ve made the switch..loose leaf tea all the way! But I’m lamenting all of the teabags I have composted. My poor wormies and soil microbes must be smothered in micro-plastics from tea bags. Yes. That’s irritated me too, before I knew! It’s frustrating isn’t it, Debbie! When it comes to zero waste and plastic-free, there’s a lot of legacy of “before we knew” stuff to deal with. Gah! Oh Kerry, I feel bad about that also! But then again, landfill is rubbish (literally, although I wasn’t trying to be funny) too. So for all the terrible microplastics, I’m still think it was better to compost than landfill. Just wished I’d realised about 10 years ago! Your first blog post on this topic convinced me to switch to loose leaf tea! Hurrah! No doubt your cups of tea are so much better these days, Kirsty! I use loose, but still some bags where I can’t get the variety. I’ve petitioned both Pukka and Clipper as I don’t think there should be any plastic in organic tea! Pukka don’t use plastic in their teabags but the envelopes each teabag come in are made of plastic. Saying that, I think I read that they are looking to switch, so that’s good. I know what you mean about organic tea. Planet Organic have the heat sealed teabags with the plastic component, it seems like a contradiction to me! Wow! I never knew. I too have thought they were compostable. I buy loose, but have bought bagged. Never again. It’s amazing how a whole industry thinks this is okay. When selling only loose tea is much easier. Thanks, Lindsey! Hi Caroline and sorry to be the bearer of bad news :( Still, if you already buy loose then you are half way there! I’m not sure what to make of it. They both claim to be plastic-free, but they don’t say what it’s supposed to be. It sounds like PLA to me. It might just be bad reporting (plenty of that around! ), since PG Tips don’t actually claim it will be plastic-free on their website (not sure about the Co-op, couldn’t find anything on their website). I have a tea steeper, but I find it really annoying and painful to use. It’s hard to hold open (which hurts my hand) and the leaves get stuck in the edges, stopping it from closing properly. I also can’t work out how to clean it easily. Larger leaves stick like film to the inside and smaller bits get stuck in the mesh. What do you do if you’re making tea for multiple people? A teapot only works if everyone is drinking the same type of tea. Hi N, actually I was going to mention this news, except when I looked into it I realised it’s a lot more complex (because yes, many of the companies are saying they will change to bioplastics, which are not necessarily compostable or biodegradable). Definitely misleading reporting in some (many) cases). I thought it better to separate this out into another post. Stay tuned! There’s lots of different types of tea ball / steeper. I have a couple, and I also have a tea strainer. Which means I can do three different varieties at once when I have guests! I’m confused… I send a mail to Or Tea? to ask if they use plastic in their tea bags. Their answer was “no, we are proud to say our tea bags are made of corn starch and unbleached cotton, so no plastic is used!” But corn starch is kinda plant based plastic, right? But is it compostable or not? And therefor good or bad? Hi Jenny! Yes corn starch is plant-based plastic, it has the same principal properties as plastic and is classified as plastic #7. With all the negative press, companies are keen to distance themselves from “plastic” – but corn starch is still plastic, albiet one made from plants rather than fossil fuels. Personally, I’d track down a paper only brand or switch to loose leaf. Hope that helps! A lady I came across told me she found a robins’ nest. The robin had been raiding her compost heap for what was left after the tea had disintegrated from within the tea bags, and was using them to make a nice cosy nest lining! There are more herbal teas to try – sage, dill, meadowsweet flower, raspberry leaf, limeflower, thyme, lemon verbena, bog myrtle and more. You can dry these in shade in an airy place, then put them in containers for winter. I always forget this, but your graphic really helped get through to me! Thank you! Ah, my pleasure Celia! I think it sums it up quite well – it is a confusing topic! Shouldn’t have assumed just because I was buying organic teas that the bag would be earth friendly. Sadly I’ve got dozens of kinds of tea and won’t be able to enjoy them now I know plastic is one of the ingredients. Argh it’s a tough journey !! It is crazy, Karen! I made all kinds of assumptions at the start. Like organic meant plastic-free, or that “eco friendly” was a meaningful term… Still, we learn and we grow! And whilst tough, it is infinitely rewarding! My ‘Virgin Garden’ brand organic tea bags from the supermarket claim “unbleached paper tea bags”. That sounds like you’ve found a good one, Jill! It never hurts to email and double-check, but I think you are onto a keeper! Hi. I asked the question about the bags I use and this is the response I got….. can you tell me if they are ok? Thanks. Our pyramid bags are biodegradable and are made of PLA [Polyactic Acid]. This is a derived from food stuffs such as tapioca. The material is sourced from Japan where it was invented in the 1980’s. Ah Jessica, PLA is the plant-based plastic, categorized as plastic #7. “Biodegradable” as a term is pretty meaningless unless we know “into what” and “over what time frame”. It can be argued that a plastic bottle is biodegradable – it will just take 450 years and leave toxic residue. Many tea bags use the Japanese certification scheme GreenPla, which specifies that the plastic must be 60% biodegradable to achieve certification. That’s not actually much more than half! They also allow the presence to toxic heavy metals. Personally, I steer clear of any plant-based teabags. I’d opt for paper only brands where possible (there are a few) or loose leaf tea. Hope that helps! It’s complicated, I agree! (I have a degree in Biochemistry so I geek out over all the science, but I get that it isn’t everyone’s “thing”!) In short, being plant-based and made from plant sources (corn, tapioca etc) is no guarantee that it will be biodegradable or compostable. There’s no strict guidelines around terms like “biodegradable” either, so companies slap them on. A product could be biodegradable over 500 years and biodegrade into toxic residue, and it is still technically “biodegradable”. Some products might have certification which tells us the time taken and the residue: as an example, the teabags that use the GreenPla certification scheme can get the certification if they only biodegrade by 60%. That’s not much more than half! In short, if we want natural products that truly return to safe components, we are better off with paper or loose leaf tea than cornstarch teabags. Thank you for the information. I read your post months ago and have given up the few tea bags I was still using. To clarify, are you saying the plant based bags actually are or become chemically toxic as they decompose? Or just decompose at an unacceptable rate? Is it truly a chemical toxicity issue or a decomposition issue? Thank you. Being mainly a coffee drinker, and an instant coffee drinker at that, am I safe? or are their things I should look out for? Do you know about dilmah? I put them in the compost and worm farm and have never found a trace of them afterwards, and we put a lot in there! You will be happy to know that Dilmah teabags are free from plastic. The tag, string and teabag are all 100 percent biodegradable. ‘Do Clipper tea bags contain plastic? Very useful post! Thank you. I mostly buy loose tea but would sometimes buy tea bags, now I know they probably contain plastic, so I’ll stop. I am extremely shocked and I also feel super stupid and just sad. Thank you for the information though. Ignorance sure is/was bliss but cant be an option. But now what do I do with all the teabags I already have bought? As much as I hate plastic, I also hate waste. But I sure dont want that plastic in my mug of tea. Maybe I can tear open the bag, put that into the proper recycling bin and brew the tea as I would with the usual loose tea. I am not sure that would work as the tea in tea bags is often very fine powder. Any thoughts on that would be highly appreciated! I was really hoping it wasn’t as bad as it apparently is. The last straw for me was a mason jar of Humble Tea. What a good idea I thought, and wanted to support. I was perplexed at the pyramid tea bag and thought that it could not possibly be environmentaly safe. Something so perfect looking – very twee. The jar sits on the counter as an example of the folly of humankind. Thanks for your website. Plastic teabags are an unnecessary and horrifiying convenience. I don’t think I exaggerate.